Last weekend was a pretty long weekend in November as Hari Raya falls on Friday. Since I had an extra day off, I baked something new which I never tried before. Yes, it was a peach tart and the recipe source was from my favourite home baker HHB. I tried cheese/chocolate/ blueberry tart before ( bought from bakery shop of course) but not any fruit tart. I don't know how will a fruit tart taste. 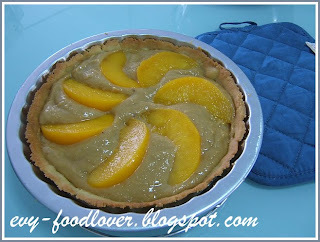 I was so eager to try it out after looking at the photos of peach tart in HHB's blog. 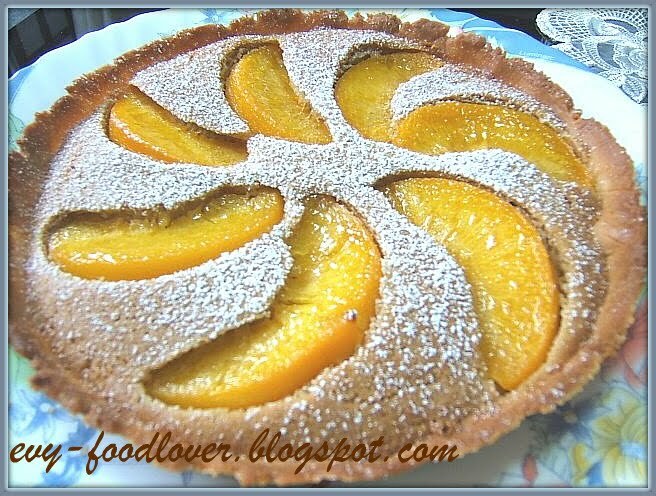 The color of the tart is so beautiful and it was nicely presented. I was so sure that the taste is going to be great as well. 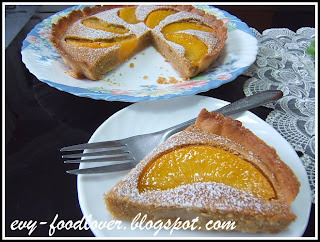 The taste of my own peach tart proof that I didn't guess wrongly. 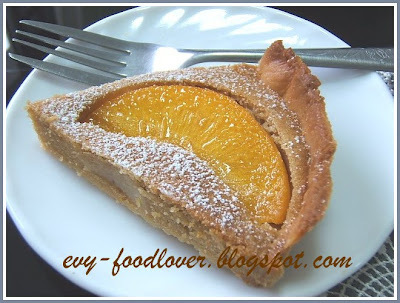 The taste of Almond in pastry and peach is a good match and it is just delicious. Thumb up! My husband was telling me that the tart is quite big and it is going to take a few days for us to finish it. 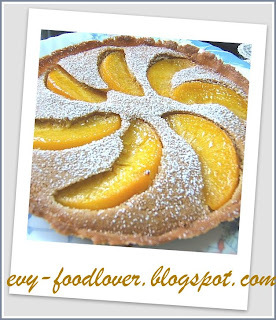 But you know what, we finished the tart within the same day as it was baked! LOL. I am sure that you are going to like it as well. Toast almond powder on high heat (in a pan) for 10 mins. Let it cool and set aside. 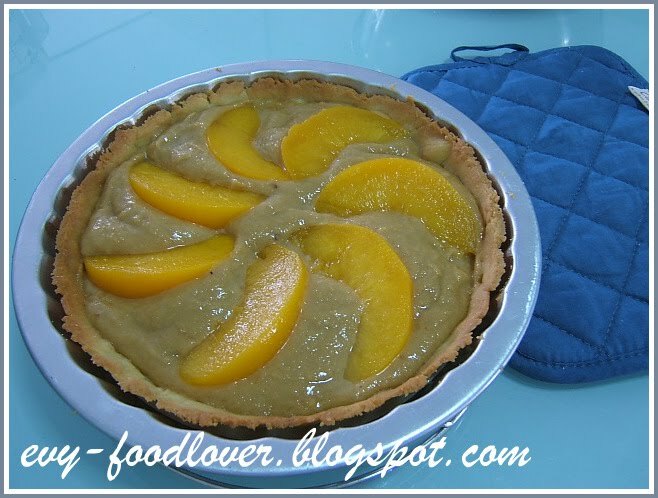 Mix sieved flour and ground almond. With a manual whisk, cream butter and sugar till light and fluffy. Then add by 1 Tbs of lightly beaten egg. Fold in the flour-almond mixture into the batter (I separately added 2 times). Form and shape the pastry into a round ball. Wrap with cling wrap and chill in the fridge for about 20 mins. Use a fork to poke holes on the pastry. 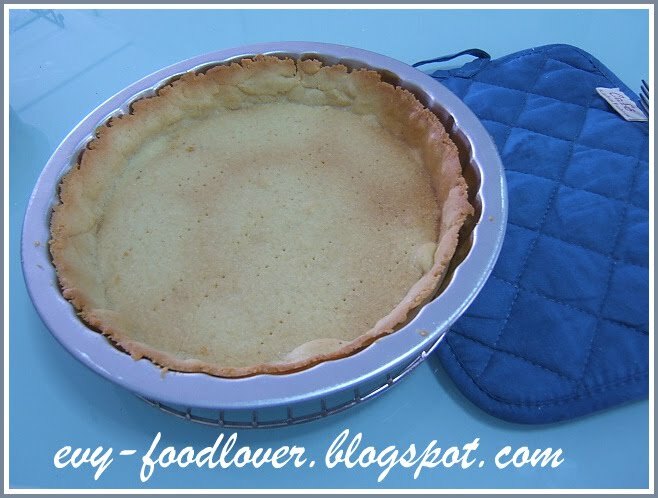 Bake in pre-heated oven at 180 deg C for 10 ~12mins until the edges are slightly browned. Let cool completely. 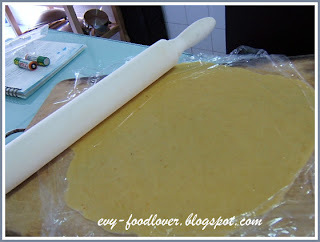 With an electric mixer, cream butter and brown sugar till fluffy. Add in the egg gradually. Using a spatula fold in grounded almond. Sieve the flour into the mixture. Mix well with a spatula. Spread the filling onto the cooled pastry base. Line with peach slices. Bake in pre-heated oven at 170 deg C for 30 ~ 35 mins. 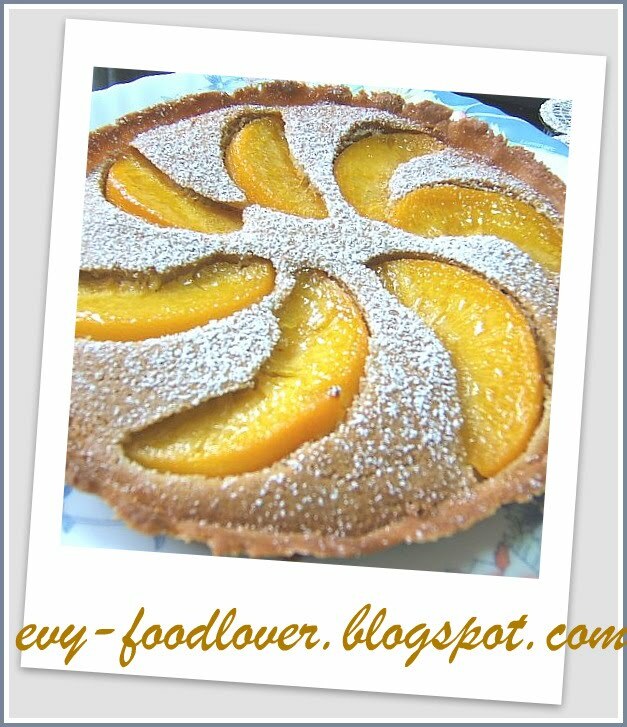 Let it cool, and dust with some icing sugar.